Ahead of the wedding, Nick Jonas and Priyanka Chopra, who stars on the cover of Vogue's January issue, opened up about their journey together. As Priyanka Chopra and Nick Jonas get ready to tie the knot in Rajasthan this weekend, Vogue magazine has revealed a timeline of their relationship. 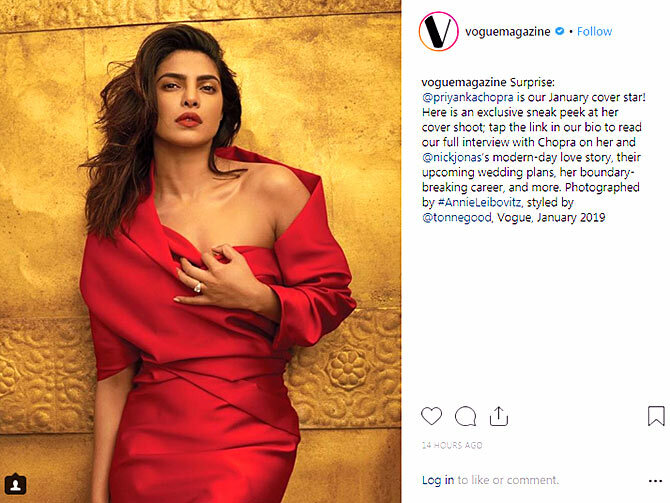 The bride-to-be, who graces the mag's January 2019 cover, has divulged details of their love affair in a candid interview with Vogue. Read on to find out more! As the story goes, the proposal took place at the Vanity Fair Oscars party in 2017. The mag describes the episode: 'Jonas was hanging out at the bar, dressed in a velvet suit, a white rose tucked into his breast pocket. 'He noticed Chopra breezing through, in a long black sequined Michael Kors Collection dress. Later, when they went out on a date, Nick said the words every woman would love to hear. According to Vogue, 'She (Priyanka) was on a date in L.A. with Jonas and he said, "I love the way you look at the world. I love the drive you have." 'In Los Angeles later that month (after the Met Gala 2018), Jonas invited Chopra to a live performance of Beauty and the Beast. They met at the Chateau Marmont. 'The next night, they went to the Dodgers game. The following morning, Jonas called his mother and informed her that he was going to marry Chopra,' the mag reveals. 'Jonas proposed in Crete. As far as Chopra knew, it was to be a birthday trip. 'Jonas waited until after midnight, so that future engagement anniversaries would not coincide with her birthday celebrations. 'He had the ring with him, having shut down a Tiffany & Co. in London to pick it out with his brothers a few weeks earlier. 'No joke -- she took about 45 seconds. Forty-five seconds of silence. So he told her, 'I'm going to put this ring on your finger now unless you have any objections.' The rest is history. According to Vogue, there will be two ceremonies -- an Indian wedding and a Christian service-- and both the functions are to be held in Rajasthan. The Christian service will be officiated by Jonas's father. 'Jonas will dress like royalty, as is customary -- turban, sword -- and he’ll ride in on a horse,' they wrote.